We’ve had boats, double decker busses, campers, RVs, transporters, etc using cork for a floor/sound reducer. The luxury yacht was the most interesting. 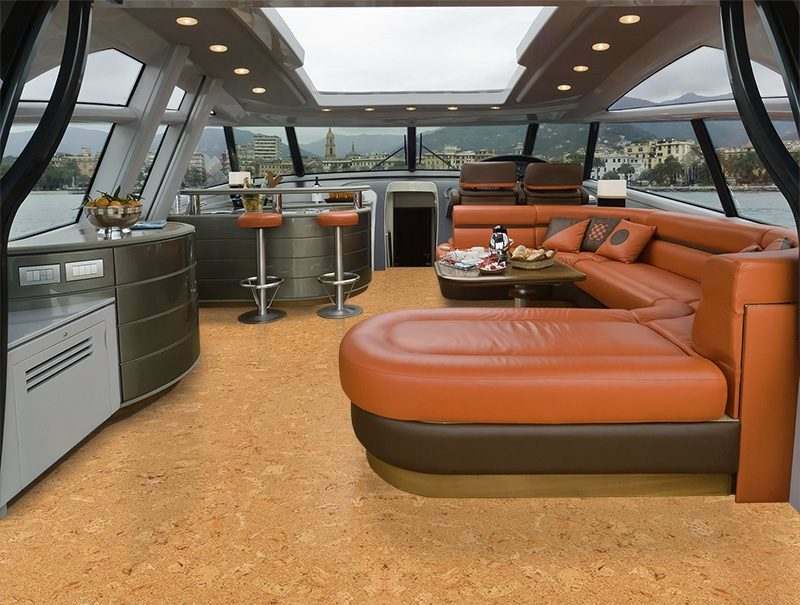 He used the 6mm Salami as flooring as well as wall decor and table tops in the yacht. The yacht was designed as a moving board room (San Diego I believe). The Salami cork tiles was such a hit for the flooring, the owner used it as ‘wood panelling’ and as the finish for the table tops. He said it looked magnificent – very high-end! Just what he wanted. He did this because he was so impressed with the sound reducing qualities of the floor that he added the interior decor to magnify the “silent ride” he had created. That’s one of our “cooler” projects with cork glue down. Our floors cannot be used outside. That being said, I have had a sailboatowner use our glue down tiles for an exterior floor application on his boat. He laid 40 sf on the exterior of his craft (where he stands at the helm). He was very pleased with the result. Needless to say there is no warranty on it, but he didn’t care. He used the Wakol D3540 adhesive and sealed the floor with 3 coats of the Loba. It did everything he wanted it to. But no warranty. My guess is it should last 5- 10 years before the environment takes over. We have helped with close to a dozen boat restorations using cork glue down tiles. The most important factor is subfloor preparation. The subfloor must be clean and dry (space heater must be used if it is cool and damp prior to installation). Once the floor has been installed, you will apply 2 coats of water base polyurethane to the cork to make it water proof. Once the finish is cured you have a fully functional cork floor on a boat. Does cork underlayment work under ceramic tiles?